Grass leys rich in clover and forages, such as lucerne, can increase protein supplies and reduce dairy producers’ reliance on bought-in feeds. There is great potential to grow more protein on many of our dairy farms, according to Limagrain’s John Spence. He says adding protein-rich crops, which are managed to maximise their value, will have a significant impact on the value of home-grown forages in the diet. 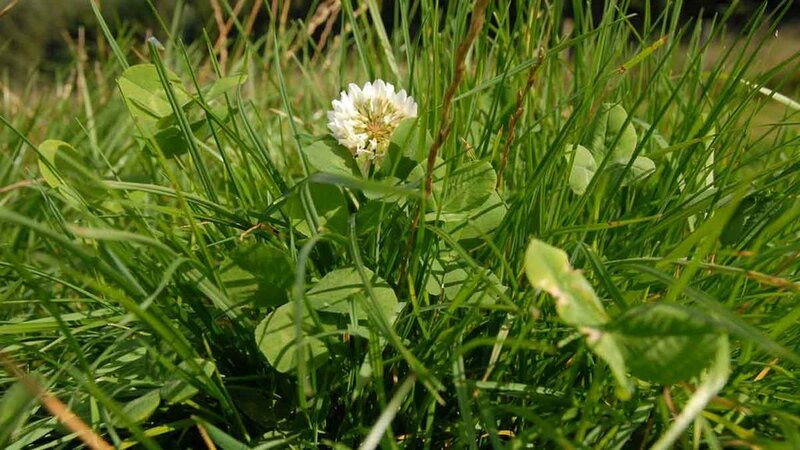 A 30% clover content is ideal in grazing and cutting leys, with white clovers, being shorterstemmed, typically used in grazing situations. Both red and white clovers are rich in protein, by as much as 10% more than a perennial rye-grass. White clover has a crude protein content of about 25% and a white clover/grass sward is capable of fixing 180kg/hectare of nitrogen. The crude protein content of red clover is typically 20% and can fix 250kg/ha of nitrogen in a grass sward. Sown straight, red clover will yield 10-15 tonnes/ha. Both clovers are rich in minerals and are highly digestible, with D values in a grass/clover sward higher than a pure grass sward. Mr Spence says: “White clover can be included in the grass seed mixture or added after grass is established.” He recommends a rate of 2.5kg of clover seed/ha to achieve 30% coverage. The pelleted seed is coated in a soluble material, so it is larger, making it easier to sow, and heavier, which improves soil to seed contact. In the case of Limagrain mixtures, Mr Spence says the seed can be treated with the biological germination accelerator Headstart Gold to promote more rapid establishment. In Limagrain trials, mixtures which include white clover typically have a protein content about 4% higher than pure grass leys, although this can be as much as 8% in summer when grass growth slows down and clover growth is at its peak. Trials carried out last year by Teagasc at Moorepark, Ireland, showed including white clover in the sward increased milk yield by 728kg/cow/ year and milk solids by 58kg/cow. With crude protein contents of about 20%, yields up to 18t DM/ha and the ability to fix 250kg N/ha, lucerne is an undervalued forage crop on UK dairy farms, according to Limagrain’s John Spence. It has a deep-rooted system so it can withstand drought and grows best in well-drained soils, sown from April onwards. As with grasses, protein levels are at their best flowering and delaying cutting until flowers have emerged will typically see protein levels drop by 3% or 4%. Record-breaker “French dairy farmers have relied on lucerne (alfalfa) in the forage mix for many years and there is no sign of any change. “The latest variety to be introduced, Mezzo, will attract more interest, thanks to its record-breaking yields.” Available to UK growers in spring 2018, Mezzo has produced yields of 18t DM/ha in trials, 5% ahead of other varieties on the UK market. It is disease and nematode resistant and has a dormancy rating of 3.6, making it more winter hardy and persistent than many other varieties. However, he points out that modern varieties of red clover can persist well for four years: “So we are now partnering them with perennial rye-grasses to extend the productive lifespan and nutritional value of the sward. Sinclair McGill’s Admiral’s Choice and LGAN Protein Silage are examples of these mixtures.” There is good reason for farmers to be more discerning when selecting grass seed mixtures. Mr Spence says: “Protein enriched grass seed mixtures will typically include clovers, but they can also include advanced grass varieties with a proven record of boosting the feed quality of the forage. “The cheapest mixture may be false economy. Look at the mixture carefully and its feed quality information. This is just as important as its growing and yield attributes. “We have evaluated the nutritional characteristics of a high number of grass varieties, measuring quality at every cut. “From this, we have identified those which combine the best of agronomic qualities and feed value. “These varieties have been included in our LGAN accredited range. They are proven to provide a balance of sugars, digestible fibres, protein, energy and D values. Based on data from trials carried out at the Schothorst Research Institute, Netherlands, cows fed on a diet including the LGAN grass mixture produced 1.4 litres per day more milk than a group of cows fed a dual-purpose mixture. Lucerne is a protein-rich forage, with the most recent variety, Mezzo, launched in the UK in spring 2018, out-performing currently available varieties.